Thirty Minutes Over Oregon Book Release! 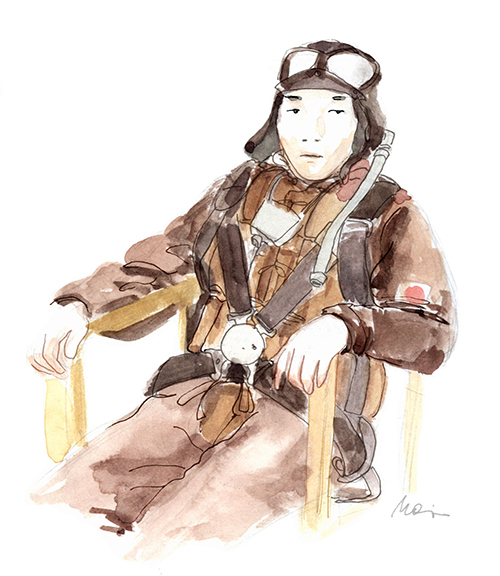 On September 9, 1942, World War II Japanese pilot, Nobuo Fujita, bombed the Oregon Coast. Thirty Minutes Over Oregon is the story of how that incident led to the amazing events that followed. I won’t give away the ending to this moving story, masterfully told by Marc Tyler Nobleman — you’ll have to read the book! I was first offered the manuscript for Thirty Minutes Over Oregon in early 2016. Marc had written the story years before, and he details the manuscript’s journey on his blog. I had worked with our editor, the wonderful Jennifer Greene, at Clarion Books over a decade ago on several of my earliest picture books. Good Night Engines by Denise Dowling Mortensen was the third book I ever illustrated. Since that time my illustration style has evolved tremendously. Jennifer was drawn to my daily watercolor quick sketches of people in Brooklyn that I had been posting every day on Instagram and Facebook. When I first read Marc’s manuscript, I knew immediately that I wanted to do it. The story resonated with me on several layers. Being of Japanese descent and American, and having lived in both countries, I felt connected to both cultures. My parents were born and raised in Hawaii and were actually teenagers living on Oahu when Pearl Harbor was bombed. And while not interned in camps like the Japanese Americans living on the mainland of the U.S., they were deeply affected by WWII. Coincidentally, my father now lives in Oregon several hours north of the bomb site. Most importantly, though, I was so moved by the act of forgiveness and reconciliation demonstrated by both sides of the conflict. It is quite extraordinary the way the relationship between Nobuo and the town of Brookings (located near the bomb site) evolved. Although I felt strongly that I wanted to illustrate this amazing story, I would be lying if I said I wasn’t also terrified. 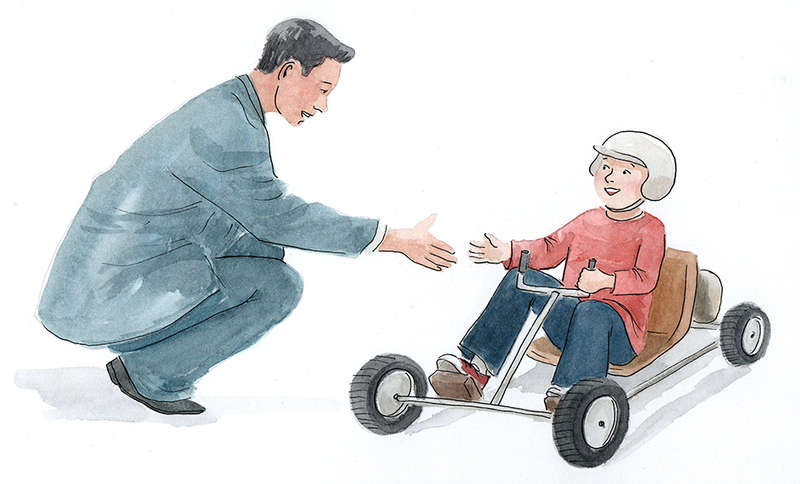 I had never illustrated a non-fiction 40-page picture book for older kids before, much less one in watercolor! It was completely out of my comfort zone. In my almost 20 year career of illustrating children’s books, I can honestly say that this one was the most difficult! There were many times that I felt like I was failing. Because my sketch style was so intrinsic to working from life and from photographs and because this story is based on a real person, I knew I had to find relevant photo reference of Nobuo at different stages of his life. The plane Nobuo flew was a Yokosuka E14 Y Glen seaplane that could be disassembled and stowed and transported by an I-25 submarine. A lot of the story takes place in Brookings, Oregon over several decades. I knew I had to find reference to be able to paint these and wanted my illustrations to show these things accurately. I am indebted to many, many people who helped me during the research phase of the project. I got as much information as I could at the Picture Collection and Periodical Divisions of the NY Public Library. And I made a truly memorable trek out to Brookings, Oregon. 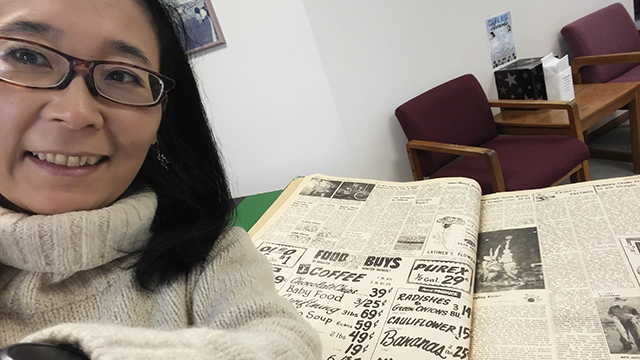 The wonderful folks at the Curry Coastal Pilot newspaper opened their archives to me to peruse at length. I was able to gather a ton of photo reference and news clippings that would have been impossible to procure outside of their offices. Don’t you love the prices of the food!? 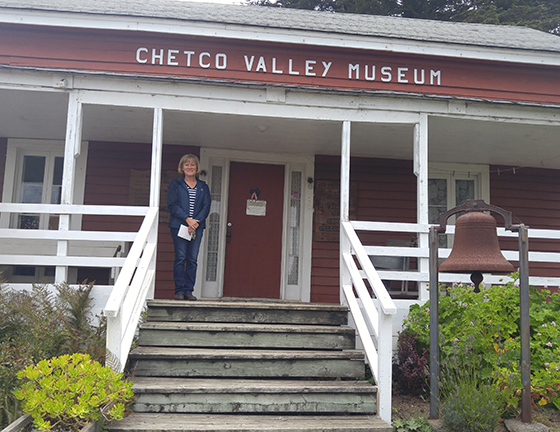 I also had a personal tour of the Chetco Valley Museum by Patty McVay. I spent several hours at the Chetco Library where Nobuo donated his 400-year-old samurai sword. He also generously donated thousands of dollars towards multicultural children’s books where they reside in the library to this day. But the highlight of my visit was hiking with Bill Schlichting, a reporter at the Curry Pilot. He drove me to the forest and kindly showed me the actual bomb site. There is a memorial there and it was so incredible to view it in person. Bill and his dog, Dippy. The memorial at the bomb site. Back in NY, I poured over all of the material I had amassed and sketched a ton. Some of the printed reference material I collected from the internet, the Curry Pilot, my own photos. I divided them into categories, such as “BOMBS”, “PLANES”, etc. The amazing Caldecott winning author/illustrator, Brian Floca, who lives in my neighborhood, gave me sage advice and generously sent me a link on Ebay to buy a model of the actual plane Nobuo used on his pre dawn flights! It was really helpful for drawing and painting different angles of the plane, which I ended up painting countless times! During the painting process I had several obstacles. For one, I sustained an arm injury unrelated to the project and I was unable to use my dominant hand for awhile. I used this time to read and also just watch watercolor tutorial videos on YouTube so I could enjoy painting vicariously. To some extent, I learned how to paint with my left hand as well. I did early preliminary sketches of scenes with both hands at times. When my arm was much better, I was able to start painting the finals. 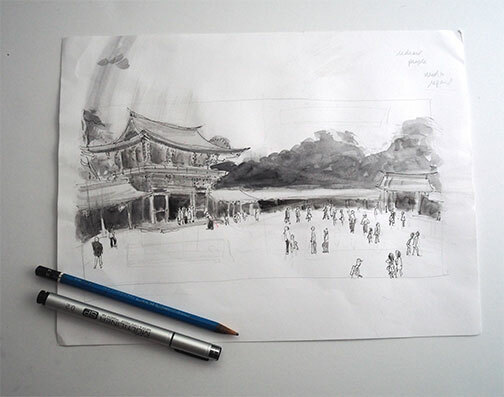 There I faced my second major obstacle: How would I paint the illustrations? 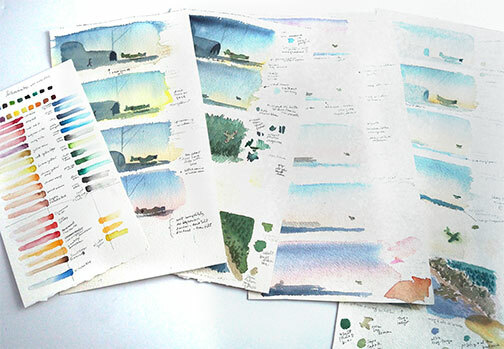 I first started with a lot of small color studies to figure out which colors to use and how to mix them. I wasn’t sure what size to paint the images. Normally I work at 100%, but I had a lot of problems painting at this scale with watercolor, as I had been training myself with much smaller pieces. My daily sketches are only about 3” x 4” in size! So I ended up painting the same scenes many times. Watercolor is an unforgiving medium. 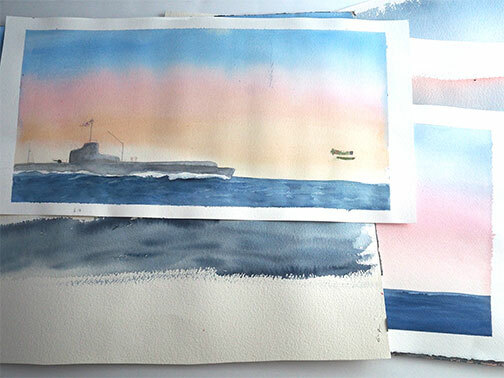 During the process I often felt like I didn’t know how to paint with watercolor. Just a small portion of the many paintings I did! Some paintings I didn’t use. I finally had a brainstorm: I needed to just do the paintings at a smaller size! 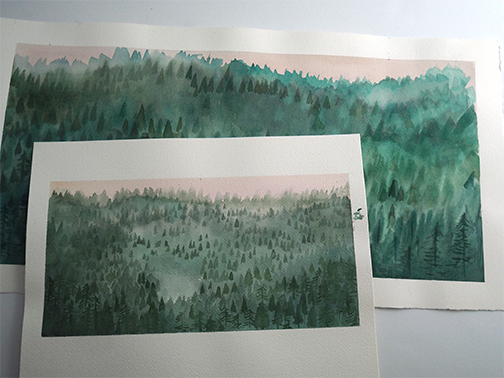 Unlike with my daily paintings, I decided to separate my line from my watercolor. I knew I would have to revise things, and truth be told, I was a bit nervous about drawing directly on my painting and risking having to do the whole thing over again if I made a mistake with my inking! So I drew my ink line on vellum and bristol paper and scanned that in with the watercolor and assembled them in Photoshop. This process worked out well with the text I incorporated in some of the images. I didn’t want to use actual newspaper clippings, so I recreated parts of them by hand. I was able to layer different elements together and assemble them in Photoshop. 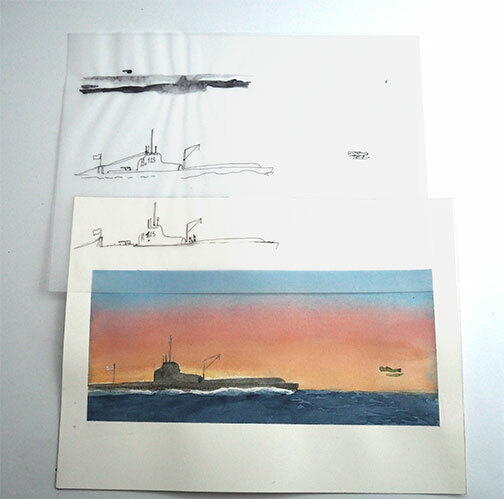 I scanned my paintings at 600 dpi so they would print clearly when enlarged. Final piece with elements scanned in and combined. By the time I was ready to turn in all of my artwork, I had studied and looked at it for so long. All I could see were things I could have possibly done differently. I think this is common and have heard this sentiment from other artists about their own work. There is always room for improvement. But I know that I did the best I could have possibly done at that time and place in my life. I do hope I did justice in helping to tell this story with my pictures. It’s definitely a story that needed to be told and shared. Seventy-six years and one month after the first bomb was dropped, on October 9, 2018, the book will be released and it is available for pre-order now online or in your local bookstore! 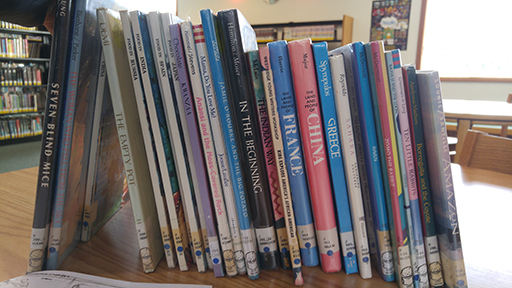 Marc and I will be on a panel with other non-fiction picture book authors and illustrators to talk about our work at Books of Wonder (Upper West Side store) this Sunday, 3-5. Please join us if you are in the area! Pizza Day Is Launching and Book Giveaway! I'm so excited to announce that Pizza Day will be released next Tuesday! In addition, the board book version of Soup Day will also be released. Both books celebrate cooking with kids and healthy eating. In Pizza Day, a boy and his dad spend the afternoon making pizza from scratch using the ingredients they have grown in their garden. A recipe for the pizza they make is included at the end! To get a peek inside the book, check out this book trailer that my son, Jamie, made for me. To celebrate the release of Pizza Day and Soup Day, I'm giving away a signed copy of each to three lucky winners*. To enter, leave a comment below telling me your favorite kind of pizza and share this post on Facebook, Twitter, and Instagram. Leave a comment (one for each share) telling me you did. Entries will close October 31 (Tuesday) at 5 pm EST. Winners will be chosen and announced here and on social media soon after. I will contact you via email. *Only available to readers with a US address. Sorry! I am hosting an Book Giveaway of Pizza Day available to readers in the US, Canada, GB, and Australia at GoodReads though starting October 30! View posting here. Last month the group show I am a part of opened at the galleries of the Interchurch Center in Manhattan. After communicating with the other artists for so long on social media, it was great to finally meet them in person at the opening! 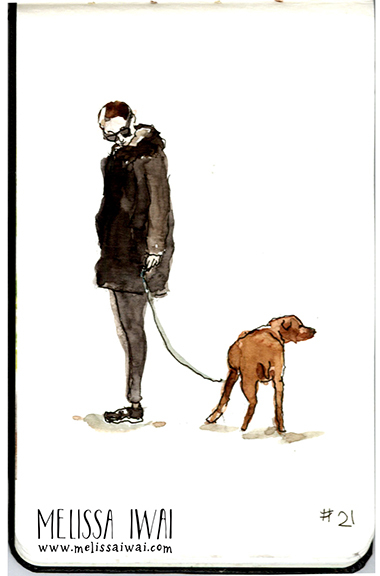 I just love the attitude and body language of these girls in Patricia Keeler's piece! Isn't this Asian Snow White and the Seven Dwarves by Yuko Katakawa lovely!? I just love this painting by Naroth Kean. It's so arresting and delicate at the same time. Naroth's is on top. Again, sorry about the glare! Here's another bunny I did with his friend, Bear. I'm so proud to be part of this group of fantastic illustrators. Thanks for Frank de Gregorie and Tracey Del Duca for curating it. A blog about healthy eating and cooking with kids.